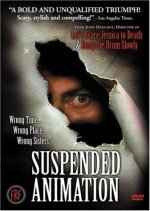 Suspended Animation release date was Friday, October 31, 2003. A small cabin, hidden deep in the snow-covered hills of Northern Michigan is Hollywood animator Tom Kempton's only refuge after getting separated from his friends on a snowmobile trip. What started out as a relaxing getaway, becomes a waking nightmare when Tom finds himself at the hands of two psychotic sisters who plan to make him their next victim. A last minute rescue leaves both sisters presumably dead and Tom narrowly escaping with his life. Upon his return to Hollywood, however, Tom develops an unhealthy obsession with one of his captors that ultimately threatens the life and welfare of his family.